Casino Euro will then reward you with a bonus (Welcome Bonus is for new players only). The terms and conditions of the bonuses vary between different casinos and might also change over time and between different countries, so it is important to compare the different offers and read the T&C for Casino Euro before signing up. Casino Euro, Europe’s favourite online casino, not only boasts one of the largest game collections on the online gaming scene but also offers daily jackpots guaranteed to deliver every single day of the week. 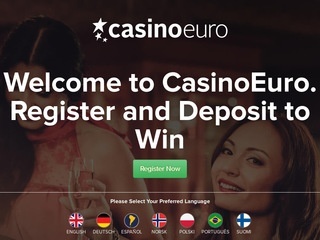 Casino Euro, established in 2002, is one of the reputable gaming sites operated by the Betsson Group. Simple yet attractive website provides access to over 1,500 games from more than 20 top-notch developers. The Casino will welcome new members by doubling their first deposit, provide daily deals consisting of free spins, cash giveaways and competitions, and offer a Guaranteed Daily Jackpot exclusive to Betsson Group. Lucky winners will see their cash-out requests processed within 24 hours and players in need of help receive assistance any time night or day. The MGA and the UKGC licenses are the best assurance one can get as far as safety and fair play are concerned. 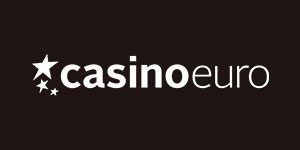 Casino Euro has filled their portfolio with more than 1,500 slots, table games, Video Pokers and live games, and in order to that, they had to partner up with more than a few developers. The list of contributors includes NetEnt, Microgaming, NYX, Play ‘n GO, Yggdrasil, WMS, Thunderkick, Elk Studios, Quickspin, IGT, Red Tiger Gaming, Push Gaming, Big Time Gaming, Blueprint Gaming, Lightning Box, Pragmatic Play, Playson, Leander, iSoftBet, Betdigital, NoLimit City, FUGA Gaming, plus a few others. All games are instantly accessible online, both via desktops and iOS and Android mobile device, and can be tested for free while logged out. When one sees a collection of close to 1,400 classic and video slots, they can be sure they’ll find all big hits as well as brand new titles. Gonzo’s Quest, Immortal Romance, Guns n’ Roses, Thunderstruck II, Hugo, Gemix, Foxin’ Wins and Medusa are some of those every slots fan is familiar with and has likely played them more than once. What makes Betsson’s portfolio unique are exclusive games available only at casinos which are part of the same group. One of them is The Untouchables, a 1920’s Mobster-themed video slot featuring four different mobster characters as high-paying symbols. Character wins contribute to increasing their corresponding Freespin initiation meter, and filling the meter activates free games with the character’s unique Wild Modifier. The Don’ Offer (Take It or Leave It) Bonus Game is a fun and engaging feature triggered by Scatters. Betsson goes an extra mile to please players chasing tempting jackpots. Their Daily Jackpot is guaranteed to fall before midnight every day, progressive Super Jackpot pays before it reaches €100,000, and then there is The Mega Jackpot which can easily reach millions. Speaking of millions, Mega Fortune Dreams are currently displaying more than four, Joker Millions close to six, and the unbeatable Mega Moolah has accumulated more than €18 million waiting to set one lucky player for life. Fans of table games can choose among 50+ options ranging from classic card games to multiple Roulette variants. On top of numerous standard Blackjack games, Betsson also offers Blackjack Double Jack and Double Exposure, while Poker assortment includes Casino Hold ‘Em, Caribbean Stud, Oasis, Pai Gow, and Texas Hold ‘Em Bonus Poker. The choice continues with Baccarat, Red Dog, Casino Patience, Beat Me, Swap The Flop, Craps and Super Wheel. Poker enthusiasts can alternatively pick from about a dozen Video Poker games playing as standard or Double Up versions. Small but satisfying collection includes the likes of Jacks Or Better, Joker Wild, Deuces Wild, All American and Jackpot Poker. Recently established Live Casino features casino classics hosted by live dealers and powered by Evolution Gaming, Extreme, Authentic and NetEnt. The first provides live games no one else can offer, namely American Roulette, Lightning Roulette impressive both visually and in terms of payouts, fun Blackjack Party, Live Dream Catcher, and Jumbo 7 Jackpot Casino Hold ‘Em. Authentic streams from land-based gambling venues, enabling one to soak up true casino atmosphere. VIP tables are ready to welcome high-rollers looking for high-limit games. Players looking to wager and hopefully win real cash can fund their casino accounts via credit cards (Visa, MasterCard), eWallets (Skrill, Neteller), Entropay, PaySafeCard, Bank Transfer, Sofort, PayPal and Trustly. The last three are country-specific so it’s best to check available options once the player has registered and is logged in. Minimum and maximum withdrawal limits depend on the chosen payment method and range between €10-€20 and €2,100-€100,000 respectively. Cash-out requests are usually processed within 24 hours. Provided FAQ list is well worth exploring before one attempts to contact the operator’s support agents. It’s filled with information on opening and verifying the player’s account, payment methods and their respective limits and time frames, available bonuses and relevant terms, privacy, responsible gaming, and more. If any questions remain unanswered, one can launch Live Chat for immediate assistance, send an email which the Casino promises to answer within 1 hour, or request a call-back and get the operator to ring them within 15 to 60 minutes.